Ford Motor Company raises the hybrid fuel-economy bar with the all-new Ford C-MAX Hybrid, which is now officially EPA-certified at 47 mpg city, 47 mpg highway and 47 mpg combined – beating Toyota Prius v by up to 7 mpg. Hybrids traditionally have been more economical in city driving than on the highway, unlike conventional vehicles. C-MAX Hybrid is Ford’s first hybrid vehicle to offer 47 mpg across the board. C-MAX Hybrid returns the same fuel economy whether driving cross-country or across the city – stemming mostly from a growing list of Ford innovations that have helped the vehicle to deliver an impressive list of metrics, such as its 570-mile overall range, taking customers from Los Angeles to Las Vegas and back on one tank of gas. C-MAX Hybrid is expected to be America’s most affordable hybrid utility vehicle with a base price of $25,995, including destination and delivery, which is $1,300 lower than Toyota Prius v. C-MAX Hybrid is currently available for order at Ford dealers nationwide. The power of C-MAX Hybrid stems from the combination of a gasoline engine and a battery-driven electric motor, providing customers with “real car” performance and capability. C-MAX Hybrid will offer a top speed of 62 mph in EV mode and 188 net horsepower, beating the Toyota Prius v by more than 50 horsepower. 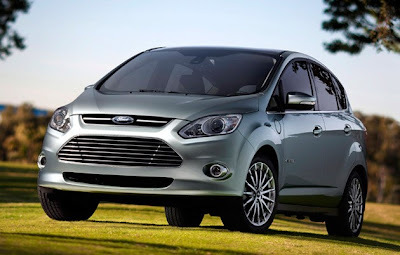 When powered by gasoline, C-MAX Hybrid uses the all-new 2.0-liter Atkinson-cycle four-cylinder engine – powerful and fuel efficient and among the most advanced non-turbocharged four-cylinder powertrains Ford has ever offered. The latest-generation SmartGauge® with EcoGuide is designed to help drivers get the most from the C-MAX Hybrid, providing information such as instantaneous fuel economy to help them more closely monitor how their driving behavior affects the vehicle’s efficiency. The vehicle has a high roofline – 63.9 inches – offering ample interior space and flexibility. C-MAX Hybrid offers 99.7 cubic feet of passenger space compared with 97 cubic feet in the Toyota. The spacious C-MAX Hybrid also provides greater headroom in both front and rear seats than the Prius v (41 and 39.4 inches, versus 39.6 and 38.6 inches). For cargo, C-MAX Hybrid has 60/40 split-fold rear seats. The seats easily fold flat with 52.6 cubic feet of space behind the first row and 24.5 cubic feet behind the second row. Maximum power of choice The all-new C-MAX Hybrid is part of Ford’s first dedicated line of hybrid vehicles that also includes the 2013 C-MAX Energi plug-in hybrid. Ford C-MAX Energi plug-in hybrid – coming later this fall – is projected to deliver 550 miles of total range, including more than 20 miles in electric-only mode, nearly double the electric-only range of the Toyota Prius plug-in hybrid vehicle. Further, C-MAX Energi delivers the top electric-only speed of any plug-in hybrid – 85 mph – more than 20 mph higher than the Toyota Prius plug-in. C-MAX hybrid vehicles headline Ford’s transformed lineup, one third of which will feature a model with 40 mpg or more in 2012, building on the company’s commitment to give fuel-efficiency-minded customers the power of choice. Ford is tripling electrified vehicle production capacity by 2013 as part of this fuel-economy push.